Hanging pouches for orphaned marsupials: Place pad at back of pouch. Put insulation between pad and animal. Birds & Animals: Boxes and hospital cages. Place pad underneath or inside box or cage. Dog & Cat Beds: Place underneath bedding and provide protection from chewing. 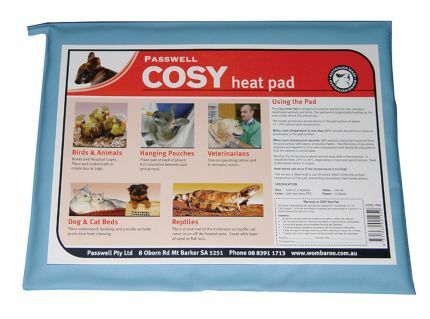 This Cosy Heat Pad is designed to provide warmth for sick, young or debilitated animals and birds. The pad works by gradually heating up the area under where the animal sits. The heater produces a temperature on the pad surface of about 15-20°C above room temperature. When room temperature is less than 10°C. Animals should be as close as practicable to the pad surface. When room temperature exceeds 10°C. Animals should be insulated from the pad surface with layers of woollen fabric. The thickness of insulation required will depend on the room temperature and should be adjusted so that the animal is comfortable. Monitor the temperature where the animal rests with a thermometer. It should be between 25°C and 35°C, depending on the age and type of animal. Seek professional advice if unsure of your animal's needs. Heat stress can occur if the temperature is too high. This device is fitted with a cut-off switch which limits the surface temperature of the pad, preventing excessively high temperatures..